Special Note #1: To further discover or awaken ever so much more about our true human potential discover author R Scott Lemriel’s The Seres Agenda and The Parallel Time Trilogy hidden truth revealing books. The Emerald Doorway (Three Mystic Crystals) is book one of this trilogy. You can utilize the special techniques section provided at the back of The Seres Agenda to explore both books and awaken the courage to recover deliberately hidden truth in the grand multidimensional universe through your own direct experiences. The Seres Agenda (pronounced like Say-Rays) is a unique hidden truth revealing book that reveals what was recently green-lit off-world for the first time in galactic history. What took place that is now underway hidden behind the scenes to our planet Earth will completely transform our world in the near future. This very unique www.paralleltime.com website was completely redesigned to showcase these hidden truth revealing books, feature film projects, radio-TV-and conference video presentations, as well as uplifting music for the courageous explorer’s well-being. “I have spent more than 50 years exploring and gaining personal experiences on the subjects that I write about, and I continue to explore ever more deeply into them for the benevolent benefit of all life and all that exists. The three books of The Parallel Time Trilogy epic adventure story reveal a most important aspect of the deliberately suppressed or hidden history of our planet and solar system, as well as some of the positive and negative off-world or extraterrestrial beings that operated behind the scenes on Earth then. They are still here today competing for the survival or destruction of our world. Everything revealed in these books is based upon numerous personal experiences with highly spiritual and technologically advanced extraterrestrials, conscious out-of-body-experiences, direct experiential explorations along the past and future time-track, and many journeys into parallel and higher dimensional realities to learn from very special Master teachers. “The Seres Agenda is a very unique hidden truth revealing journey based on numerous past and ongoing experiences throughout this lifetime with mostly benevolent human extraterrestrials, and with Masterful beings unknown to most people living on Earth today. The best way that I can state this is to say The Seres Agenda is an experiential-based hidden truth revealing epic adventure journey. The book is fictional only to a degree that the names of characters and location of certain events have been changed to protect the innocent majority of people on Earth until after a coming up-lifting worldwide transformation is more openly underway. Certain universal truths and new creations, that have been brought into existence for the first time during the past several years for the benefit of all life, will directly impact Earth to neutralize its otherwise certain destructive direction. “This book is all about an entirely unexpected and unanticipated up-lifting change in creation that has already begun to manifest. Every living thing on Earth will know in the near future without a shadow of a doubt that vast hosts of benevolent extraterrestrials do, in fact, exist. Weather one knows it know or not, we have many highly evolved extraterrestrial friends and Master teachers living on countless world systems among the stars in our Milky Way galaxy, in our nearest galactic neighboring galaxy called Andromeda, as well as in numerous parallel and higher dimensions. “Our planet Earth has recently begun to go through an entirely unexpected and unanticipated, yet wondrous transformation that will be openly revealed in the very near future. Earth’s prophesied destructive destiny was permanently altered a few years ago and its looming destruction permanently averted. 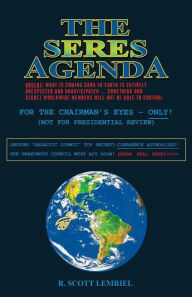 Note #2: The Seres Agenda final 4th edition, with the special techniques section added at the back for the enlightening benefit of the readers, was published in trade paperback and various down-loadable e-book forms in August of 2015. 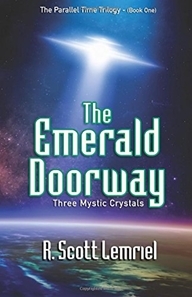 The Emerald Doorway (Three Mystic Crystals) book one of The Parallel Time Trilogy was published December 6, 2015. You can now freely explore this first episode of the uplifting, eye-opening, and profoundly revealing trilogy adventure by ordering it through this website’s Book menu tab at the top of this page. Direct links to various online book retailers for trade paperback or e-Books are provided there. Note #2: You can also directly explore the Custom Gallery, Book covers, Music, Radio and TV shows, as well as Conference Videos at the links provided below. R. Scott Lemriel is the author’s official Washington, D.C. copyright pseudonym or pen name at the Library of Congress, USA. You can check out his book and screenplay writing talents, and explore his abilities as an original musical composer/producer/and performer by further exploration of this www.paralleltime.com website. You can read more up-lifting published articles on other intriguing enlightening subjects by clicking-on the News menu tab at the top of this page that reveals a drop-down Article menu tab. To discover more about author R Scott Lemriels The Seres Agenda and The Parallel Time Trilogy Truth Revealing Books starting with book one titled The Emerald Doorway (Three Mystic Crystals) go to the Book Menu tab at the top of this page. There you can explore the large front and back covers of both books and what is written on them, as well as the chapter titles for both books. Links that go directly to the proper trusted online retailers to obtain the trade paperback or Ebooks for various Ebook readers are provided.